Prostate cancer is one of the most frequent malignancies in males. Nevertheless, to this moment, there is no specific routine diagnostic marker to be used in clinical practice. Recently, the identification of a membrane testosterone binding site involved in the remodeling of actin cytoskeleton structures and PSA secretion, on LNCaP human prostate cancer cells has been reported. We have investigated whether this membrane testosterone binding component could be of value for the identification of prostate cancer. Using a non-internalizable testosterone-BSA-FITC analog, proven to bind on membrane sites only in LNCaP cells, we have investigated the expression of membrane testosterone binding sites in a series of prostate carcinomas (n = 14), morphologically normal epithelia, taken from areas of the surgical specimens far from the location of the carcinomas (n = 8) and benign prostate hyperplasia epithelia (n = 10). Isolated epithelial cells were studied by flow cytometry, and touching preparations, after 10-min incubation. In addition, routine histological slides were assayed by confocal laser microscopy. We show that membrane testosterone binding sites are preferentially expressed in prostate carcinoma cells, while BPH and non-malignant epithelial cells show a low or absent binding. Our results indicate that membrane testosterone receptors might be of use for the rapid routine identification of prostate cancer, representing a new diagnostic marker of the disease. Androgens are classically acting in androgen-receptor positive tissues, like the human prostate, as selective transcription factors, after binding to specific intracellular receptors, translocation to the nucleus and transcription of androgen related genes, as the prostate specific antigen (PSA). In recent years, however, evidences have been accumulated that steroid, including androgen, action can also be mediated by non-classical, membrane receptor sites. These latter are biochemically distinguishable from intracellular androgen receptors, and their activation results in rapid non-genomic effects [1–5], elicited minutes after binding. Classical and non-classical binding sites can coexist in the same cells [1, 2]. Recently we have reported the identification of a functional membrane testosterone binding site on LNCaP prostate cancer cell line . Its activation results in the rapid (within minutes) secretion of stored PSA, through a specific signaling cascade (Papakonstanti et al, submitted) leading to actin cytoskeleton rearrangements. The identification of this membrane testosterone binding site is a constant characteristic of androgen receptor positive and negative cell lines, independently of the expression of intracellular receptors (Kogia et al in preparation). In the present work, we investigated whether membrane testosterone sites are expressed in human prostate carcinomas. In addition, we have investigated whether these sites are differentially expressed in malignant and non-malignant (benigh prostate hyperplasia and non-malignant prostate cells) prostate epithelial cells, using a number of methods. We show that membrane testosterone binding sites are preferentially expressed in carcinomas, and therefore they could provide additional evidences for the diagnostic discrimination of prostate cancer. Prostate carcinoma tissue was obtained from fourteen (14) fresh radical prostatectomy specimens. Carcinomas were diagnosed preoperatively by needle biopsy under transurethral ultrasound guidance, and verified and graded according to Gleason grading system [7–9], on formalin fixed-paraffin embedded sections of the surgical specimens (Table 1). All patients were free from preoperative chemotherapy, irradiation, or hormonal therapy. Regional lymph nodes (examined during the operation on rapid frozen sections) were free of metastases. Other metastases were not detected on extensive preoperative study. Microscopically non-malignant epithelia from the radical prostatectomy specimens were also harvested (n = 8). Additionally, fresh tissue samples were obtained from ten (10) patients treated by transurethral resection for benign prostate hyperplasia. In two of the benign prostate hyperplasia cases, high-grade prostate intraepithelial neoplasia foci were found and examined. Summary of cases examined in the present study. Cases 9 and 10 marked with with asterisks represent cases of PIN. The surgical specimens were rinsed by normal saline, in the operation theater, placed immediately after their excision in cold (4°C) phosphate buffered saline (PBS) pH 7.4 and immediately transferred to the Surgical Pathology Laboratory, where they were processed in no more than 20 minutes. Touching preparations were made on SuperFrost Plus slides (Kindler O GmbH, Freiburg, Germany), stained with Hematoxylin-Eosin (HE) and examined microscopically to ensure tumor location, and hence the representative sampling of the carcinomatous and non-carcinomatous tissue, or processed for membrane androgen binding sites staining, as described below. Tissue chips from transurethral specimens were picked up in a random way and processed as described above. Cell suspensions were prepared in cold (4°C) RPMI 1640 culture medium (GIBCO BRL/Life Technologies, Paisley, U.K). Each tissue sample was placed in a Petri dish with 4 ml RPMI 1640 medium, minced thoroughly with a scalpel until fragments were less than 1 mm in diameter, then repeatedly pipetted with a Pasteur pipette in order to loosen the fragmented tissue into a single cell suspension, and poured to a 10 ml glass tube through a sterile multilayer cotton gauze pad to remove clumps and debris. Cell suspension was washed twice with cold medium, and resuspended in 1 ml RPMI 1640. In order to identify the cells yield by the above described technique, cells were stained with antibodies to vimentin (clone V6, code #M 0725, dilution 1/20), human cytokeratine (clone MNF 116, code #M 0821, dilution 1/25) and PSA (polyclonal antibody code #A 0562, dilution 1/100), all purchased from DAKO, Glostrup, Denmark. Cell preparations were applied on SuperFrost Plus slides (Kindler O GmbH, Freiburg, Germany), then smeared on the slides, immediately fixed for 30 minutes in 1/1 cold acetone-methanol (v/v), stained using the alkaline phosphatase-antialkaline phosphatase (APAAP) method , and examined with a Microphot-FXA microscope, mounted with a Nikon DX-DB2 photographic camera. Tissue sections were prepared from paraffin blocks of formalin fixed tissues. Three microns (μm) thick tissue sections were cut and layered on SuperFrost Plus slides (Kindler O GmbH, Freiburg, Germany), incubated at 56°C for 2 h, washed six times with xylene (5 min each), followed by 96%, 80% and 70% ethanol (five minutes each), and finally with distilled water for 20 min. Tissue slides were then incubated in citrate buffer in a microwaves oven at 500 Watts, three times for 4.5 minutes each, washed in distilled water and Tris buffered saline (TBS, 10 mM, NaCl 150 mM, pH 7.4). Non-specific absorption of BSA was minimized by 10 min preincubation of the slides with a 2% solution of BSA in TBS, followed by two washes with TBS. Cell suspensions were incubated at room temperature with 10-7 M testosterone-BSA-FITC conjugate, as described previously . A thousand-fold BSA-FITC was used, to determine non-specific binding. Cells were analyzed by flow cytometry using a Coulter Epics XL-MCL apparatus (Beckman-Coulter Inc. Foullerton CA, USA) in a sample size of 10,000 cells, gated on the basis of forward and side scatter, as previously described . Testosterone3-(O-carboxymethyl)oxime-BSA-FITC, and BSA-FITC, were obtained from Sigma (St Louis, MO). Cell suspensions were placed on SuperFrost Plus slides, preincubated for 10 min with a 2% solution of BSA in TBS, were washed twice with TBS and incubated with Testosterone-BSA-FITC (10-6 M) for 30 min. As a negative control the same concentration (10-6 M) BSA-FITC was used. Cells were then fixed with 2% PFA in PBS for 30 min. Coverslips were mounted on to slides using a 1:1 (v/v) mixture of glycerol and (Vector, Burlingame, CA). For Vectashield the detection of membrane androgen binding sites on tissue sections, processed as described above, a 10-min incubation with testosterone-BSA-FITC was made, followed by a washing in TBS. Testosterone-BSA-FITC binding was analysed using a confocal laser scanning microscope (CLSM) (Leica TCS-NT). Mechanical dissociation of cells from selected regions of prostate specimens yielded mainly epithelial cells, as revealed by cytokeratin and PSA staining. We prefered this mild dissociation method, as enzymatic treatment of tissue specimens could modify membrane structures, leading to a loss of membrane testosterone binding. By touching preparations we ensured about the quality (not necrotic tissue, representative sample) of the tissue specimens obtained, while by immunostaining we ensured that the dissociation of tissues yielded epithelial cells, and the suspensions contained only malignant or non-malignant cells, as per case. Epithelial cells accounted for more than 85% of total cells, in all studied specimens. On confocal microscopy and flow cytometry, only carcinoma cells exhibited detectable reactivity with testosterone-BSA-FITC. A typical result is presented in Figure 1. As shown, a 85% maximal specific staining with testosterone-BSA-FITC was found, compatible with the percentage of epithelial cells in our preparations. Detection of membrane Testosterone receptors in prostat epithelial cells by flow cytometry. A: Cells were isolated from specimens of radical prostatectomy, as described in Material and Methods, stained for 10 min with 10-7 M of testosterone-BSA-FITC (blue curve, 2) or BSA-FITC (yellow curve, 1), and the fluorescence was measured in a Coulter-Epics apparatus. The specific fluorescence is the difference of the two peaks (bar B). B: Time course of the specific testosterone-BSA-FITC fluorescence (bar A in Figure 1A). Results of a typical experiment (case number 35 in Table 1). In Figure 2, typical cases of testosterone-BSA-FITC binding on cells prepared from prostate carcinoma (left panel) and benign prostate hyperplasia (right panel) are presented. As shown, Testosterone-BSA-FITC binds only to malignant cells, showing a peripheral annular staining. 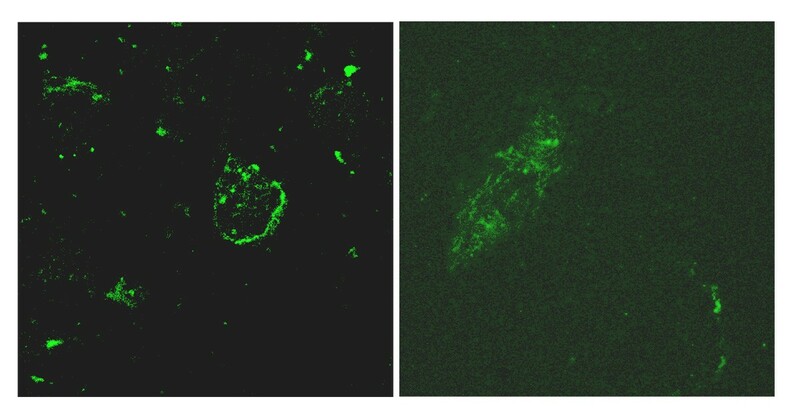 Although some unavoidable, slight, background reaction is evident with different intensity in both panels, no cell staining can be seen on the right one (BPH case). In addition, non-malignant cells, isolated from prostatectomy specimens, do not show any membrane testosterone binding. As in the case of LNCaP cells, the identification of membrane testosterone receptors can be obtained in short incubation times. It is evident after one minute incubation, and maximum binding is observed after 15 min (Fig. 1). Thereafter, fluorescence intensity remains constant for times up to one hour. As reported before for LNCaP cells , no internalization of the tracer was observed in any case of malignant or non-malignant cells, confirming that testosterone-BSA analog binds exclusively to membrane testosterone sites. Although the selectivity of the binding was not assayed in the present study, our previous results  indicate that this site is selective for androgens. Detection of membrane androgen binding sites in cells isolated from benign (right panel) and malignant (left panel) prostate lesions examined by Confocal microscopy. Positive staining can be seen only on the preparation of carcinoma cells. No staining is evident on the right panel corresponding to preparation of BPH epithelial cells. Figure 3 depicts the flow cytometry analysis of membrane testosterone binding in cases of malignant and non-malignant cells isolated from surgical specimens of the prostate. Due probably to the higher discrimination potency of the method, a specific testosterone-BSA binding was revealed in all cells. The intensity of testosterone-BSA-FITC staining was different depending on the nature of cells examined: for normal cells and benign prostate hyperplasia the staining was very low, while cells from prostate cancer were intensively stained. Quantification of flow cytometry results showed that testosterone-BSA-FITC binding was significantly higher in prostate carcinomas as compared to BPH (t = 7.65, p < 0.001) and normal tissue (t = 7.65, p < 0.001). These two latter groups showed similar results (Table 1). 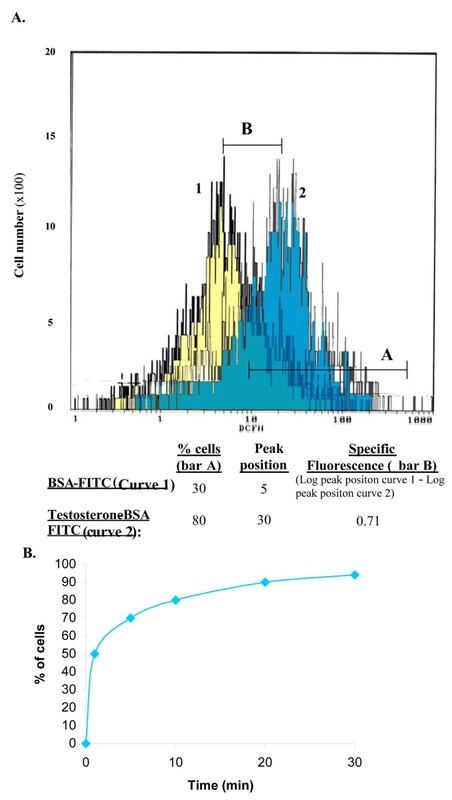 Distribution of testosterone-BSA-FITC specific fluorescence intensity in cells isolated from prostate carcinomas or benign prostate hyperplasia, and morphologically normal prostate epithelial cells, detected by flow cytometry. Fluorescent intensity was calculated as the peak fluorescence difference in cells stained with testosterone-BSA-FITC and BSA-FITC. Bars indicate the mean value. ***: p < 0.001 at least. Results are presented on a logarithmic scale. In order to be useful in everyday practice, the detection of membrane testosterone binding sites should be performed on routine histology slides. In this aim, we have developed a method for the identification of the testosterone membrane binding sites on formalin-fixed, paraffin-embedded routine prostate tissue sections, as described in Material and Methods. Applying this protocol, membrane testosterone binding sites could be identified in tissue sections obtained from the same cases studied by flow cytometry. As shown in Figure 4, carcinoma cells and cells of PIN fixed the testosterone tracer intensely and consistently, and the pattern of reaction was peripheral and annular. In addition, due to the very fine thickness of slices (2 μm), a nuclear staining is also obtained, making the method also useful for the detection of classical androgen receptors, in addition of membrane receptors. A slight membrane staining was also observed in some cases of BPH and in some normal epithelia of the gland (not shown). In some cases, in spite of a preincubation with BSA, stromal structures could fix low amounts of tracer, which in no way interfere with the epithelial structure staining estimation, and do not restrict the efficiency of the method. Detection of membrane testosterone binding sites in prostate cancer. Left panel depicts three micron sections, stained with hematoxylin-eosin. The boxed section is shown in the right panel, stained by testosterone-BSA-FITC (10-6 M) and examined in a confocal microscope. A median confocal section is presented. Prostate carcinoma is, at least initially, a hormone-regulated neoplasm, but under therapy eventually escapes and relapses [2, 11–17]. Androgen effects are classically exerted through binding of the hormone to intracellular specific receptors [18, 19], which consequently dimerize, translocate to the nucleus and bind to specific elements of DNA, affecting thus the transcription of androgen-responsive genes . In recent years, evidence has been accumulated, indicating that androgen can alternatively exert on respective target cells short-time non-genomic effects mediated through membrane binding sites and subsequent changing in Ca2+ concentration [4, 5, 20, 21], in cell types presenting [1, 2] or lacking intracellular androgen receptors [3–5]. Quite recently we have described a membrane testosterone binding site in the hormone positive human prostate cancer cell line LNCaP . We have shown that activation of this site initiates within minutes the rearrangement of actin cytoskeleton through a specific signaling cascade (Papakonstanti et al, submitted) and increases the secretion of PSA. This site was selective for androgens, and immunologically different from the intracellular classical testosterone receptor. In addition, no internalization of membrane testosterone sites was obvious after incubation times less than one hour. The results of the present study indicate that membrane testosterone binding sites can also be identified in freshly prepared human prostate cells. This binding was restrained to epithelial cells and is completed within minutes (Figure 1). Neoplastic cells, morphologically normal prostate epithelium cells and BPH epithelia bind testosterone-BSA analog (Figure 3, Table 1) but with a different intensity. In this respect, as presented in Figure 3, a clear discrimination of malignant and non-malignant cells could be obtained by membrane testosterone binding. This is also evident in touching preparations (Figure 2) and histological preparations of prostate cancer (Figure 4). It is of interest to note that cells underwent prostate intraepithelial neoplasia (PIN) are also intensely stained with testosterone-BSA, indicating that the expression of these sites might correlate with a neoplastic and premalignant (PIN) phenotype. With more sensitive methods however (flow cytometry), some slight staining-reaction of normal and BPH epithelia was also evidenced. In this respect, the difference between neoplastic and non-neoplastic cells is merely a quantitative differential expression. Indeed, two cases of transurethral resection (Table 1) in which high testosterone-BSA-FITC staining was obtained, were revealed to present foci of PIN after a thorough histological examination. Traditionally the differential diagnosis, grading and staging of prostate carcinoma has been based predominantly on morphological features [9, 22, 23]. A number of immunological markers have been proposed in prostate carcinoma or premalignant conditions (such as PIN), but they lack selectivity and specificity [9, 22–29]. Indeed, a good biomarker can be defined as one that adds independent information to standard prognostic indicators, and which can be reliably reproduced in the laboratory, aiding in diagnostic and/or therapeutic decisions. Our results indicate that membrane testosterone binding sites could fulfill this definition, as they can aid in discrimination between benign and malignant/premalignant prostate conditions. 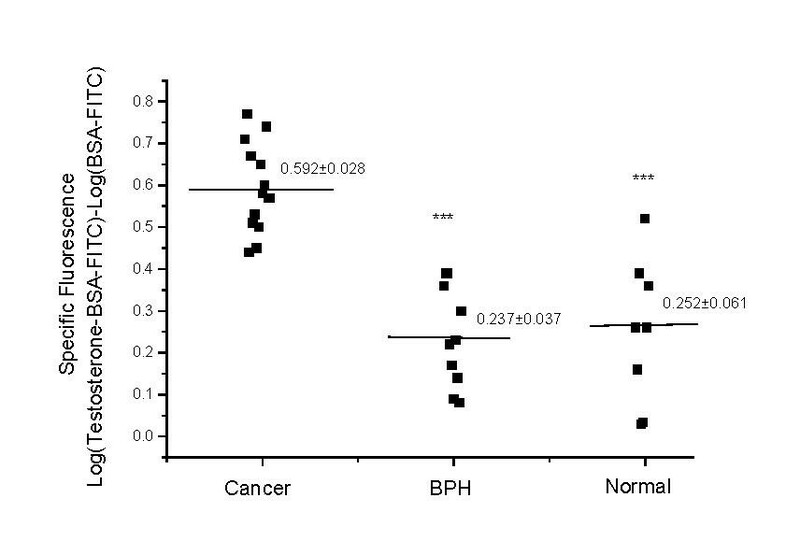 As shown in Figure 3, in only one case of morphologically normal epithelial cells the values overlapped with those obtained in the carcinoma group. It is possible, however, that a number of tumor cells could interfere with the measurement. In addition, two samples, initially considered as BPH, but finally diagnosed as harboring PIN lesions were positively stained for membrane testosterone binding sites, indicating the potential diagnostic usefulness of membrane testosterone binding sites identification and/or measurement. Although further investigations in large series are needed, our results indicate that membrane testosterone binding sites could be a valuable addition in prostate cancer differential diagnosis, and a possible target for novel therapies.